There’s no doubt that Google Earth has given us all a new perspective. Apart from being able to see our own houses from above (weird! ), we can even monitor global deforestation and track migrating animals. And while US Secretary of Energy Stephen Chu would like us all to paint our rooftops white – sending excess heat and blinding glares back into space – artist Molly Dilworth is interested in a Google Earth eco-venture that’s a bit more colorful – vivid rooftop paintings that can be seen from outer space! 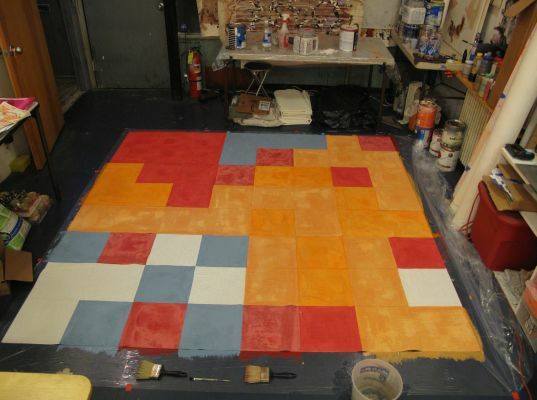 Each of Dilworth’s paintings begin with a grid that will be filled in paint-by-numbers style. 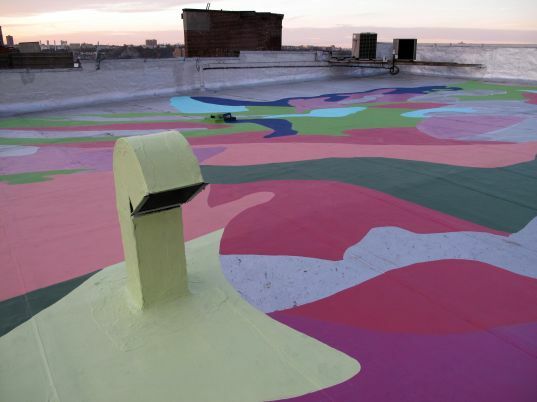 The composition of each painting is determined by the roof area, and the colors used by the amount and type of discarded paint on hand at the time. Given the nature of her process, the results are certainly unique, with some pieces offering a pixelated image that snaps into focus from a distance, and others forming assorted slurs of color. 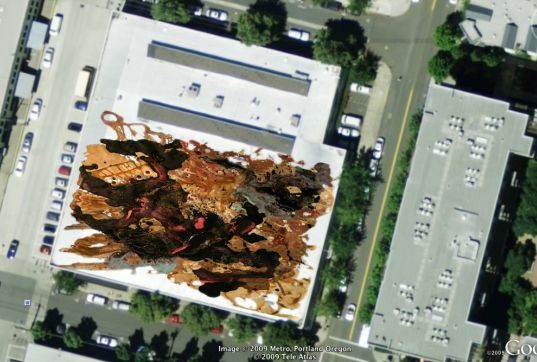 It may be years before Google Earth is updated to a point where we can see these incredible paintings from above, but this fact has been no deterrent to Dilworth’s continuous efforts. In the future she hopes to work with green contractors in order to create pieces that incorporate solar panels and reflective paint. Original, and above all beautifully done. I wonder what natural building materials left to build this house? There's no doubt that Google Earth has given us all a new perspective. Apart from being able to see our own houses from above (weird! ), we can even monitor global deforestation and track migrating animals. And while US Secretary of Energy Stephen Chu would like us all to paint our rooftops white - sending excess heat and blinding glares back into space - artist Molly Dilworth is interested in a Google Earth eco-venture that's a bit more colorful - vivid rooftop paintings that can be seen from outer space!